American manned spacecraft. Study 2005. The final Spacehab CEV concept was a three-module spacecraft using a slightly enlarged Apollo command module for return of the crew to earth. Status: Study 2005. Thrust: 44.10 kN (9,914 lbf). Gross mass: 20,000 kg (44,000 lb). Unfuelled mass: 10,000 kg (22,000 lb). Specific impulse: 350 s. Height: 20.00 m (65.00 ft). Diameter: 5.00 m (16.40 ft). It would have allowed the CEV, and an entire lunar base, to be established using existing commercial expendable launch vehicles. The spacecraft was designed for the primary mission of taking four crew to the moon and back. 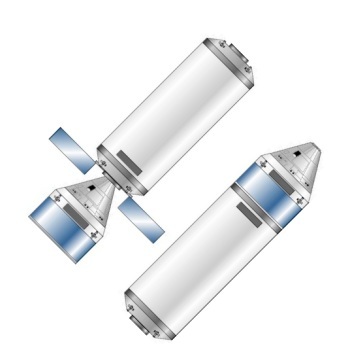 Spacehab gave the lunar mission priority, giving little consideration to the earth orbit space station support and Mars re-entry vehicle roles. The CEV would be launched into low earth orbit in a single EELV launch. 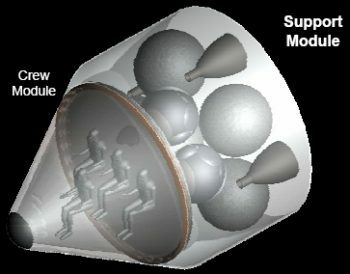 After launch, the forward portion, consisting of the CM re-entry vehicle and SM propulsion module, would separate, transpose, and dock with the SHM habitation module. It would then proceed either on its earth orbit mission, or to dock with a waiting trans-lunar injection stage to go on to the moon. The CEV's propulsion was sized to make the braking burn into low-lunar orbit, and the departure maneuver from lunar orbit back toward earth. For earth orbit missions the propellant load could be drastically reduced, and the habitation module loaded with up to 9 metric tons of payload for delivery to the ISS. These large margins were possible because the CM's mass was minimized by using the SHM to provide crew accommodation during orbital flight. Standard Propulsion Module (SPM) - these 15-metric ton modules, 4 m in diameter, provided primary propulsion for all expedition elements. They were powered by 4 x 1140 kgf liquid oxygen/kerosene motors with a specific impulse of 350 seconds. They could be loaded with up to 13.5 metric tons of propellant and were capable of propellant transfer in space. Attitude control was provided by 8 x 3 x 45 kgf thrusters. Lunar Ascent/Descent Stage (LADS) a 20-metric ton module, with 16.9 metric tons of propellant. This used 6 x 2075 kgf liquid oxygen/kerosene engines which could be throttled to 30% of maximum thrust for the landing on the moon. This took the LEV crew module into lunar orbit, then from lunar orbit to the surface of the moon, then back to lunar orbit. The return-to-the moon scenario would involve launch of the LEV to low earth orbit by an ELV; launch of the LADS to orbit by an EELV; and launch of three SPM's to orbit by as many ELV's. The three SPM's would be expended putting the stack on trans-lunar injection. The LADS would make the lunar orbit insertion burn, putting the lander in low lunar orbit. Meanwhile a further three SPM's would be launched, followed by the CEV by a man-rated EELV. Three SPM's would be expended in sending this stack on trans-lunar injection. The CEV would brake itself into lunar orbit, then rendezvous and dock with the waiting lander. The crew would enter the lander, and descend to the surface, leaving the CEV unmanned in lunar orbit. The LADS would burn a third time to take the crew in the LEV back to lunar orbit, for a rendezvous and docking with the CEV. The crew would transfer to the CEV, jettison the LEV, then head out of lunar orbit back towards earth using the CEV's engine. Near the earth the CM would separate from the CEV, re-enter the atmosphere, and splashdown in the ocean. Cargo Accommodations Unit (CAU), a one-way module that would be taken to the surface by a LADS, landing a short but safe distance from the LEV. This had a mass of 9.8 metric tons, and would provide a pressurized volume for crew accommodation on the surface, the delivery of supplies, and the storage of trash. Surface Energy and Mobility Unit (SEMU), which for the lunar base would be equipped with a nuclear fission reactor. Crew Size: 4. RCS specific impulse: 290 sec. Spacecraft delta v: 2,300 m/s (7,500 ft/sec). Electric System: 4.00 average kW. Family: Lunar Bases, Manned spacecraft, Moon. Country: USA. 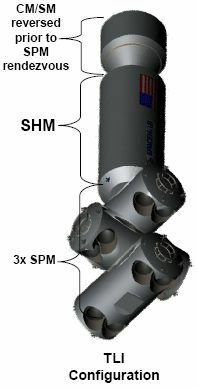 Spacecraft: Spacehab, CEV Spacehab CM, CEV Spacehab SHM, CEV Spacehab SM. Propellants: Lox/Kerosene. Agency: NASA.